Cosmoteer 0.14.1 is now available! This is the 2nd in the "0.14.x" series of updates which will introduce many new weapons and other parts that you can build onto your ships. Like most updates, 0.14.1 comes with a ton of improvements, minor features, and bug fixes. But it also adds a major new weapon: The Railgun. The Railgun is a projectile weapon that uses magnets to accelerate an explosive slug down a pair of long magnetic rails. These slugs can reach extremely high velocity, allowing them to inflict great damage and penetrate deep into enemy ships, often destroying vital enemy systems in the process. Because the railgun uses magnets to accelerate the slugs, it requires both cannon shells and power to fire. And, like the Ion Beam Emitter, the Railgun is a fixed-direction weapon that cannot aim independently of its ship. But perhaps what makes the Railgun the most interesting is that it is actually constructed using three different kinds of parts and can be built in various different lengths. Every Railgun has both a "Loader" (where the cannon shells are loaded and where the crew operate the controls) as well as a "Launcher" (where the slug exits the Railgun at high speed), and they can also have any number of optional "Accelerators" placed in between the Loader and Launcher. Every additional Accelerator that is added increases the fired slug's speed, damage, and penetration depth. As can be seen in the above screenshot, extremely long Railguns (such as the one on the newly-redesigned Archangel) can reach incredible damage and penetration, often shooting all the way through enemy ships, wreaking havoc in their path. 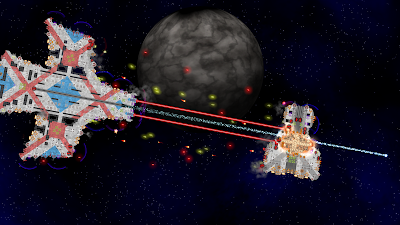 Long enough Railguns can even penetrate through enemy shields! But very long Railguns aren't without their downsides. For every Accelerator that is added, the Railgun requires that much more power to shoot. Crew must deliver power to every Accelerator segment individually, and if a single Accelerator is out of power, then the entire Railgun can't shoot, meaning longer Railguns can have a lower rate of fire unless their crew are highly efficient at powering every Accelerator. Additionally, if any single piece of a Railgun is destroyed, then the whole thing chain-reacts and explodes, possibly causing collateral damage around the Loader if it is containing any shells at the time. While Railguns are the major new feature in 0.14.1, there are also a ton of more minor improvements, bug fixes, and modding features, all of which you can read about in the changelog.